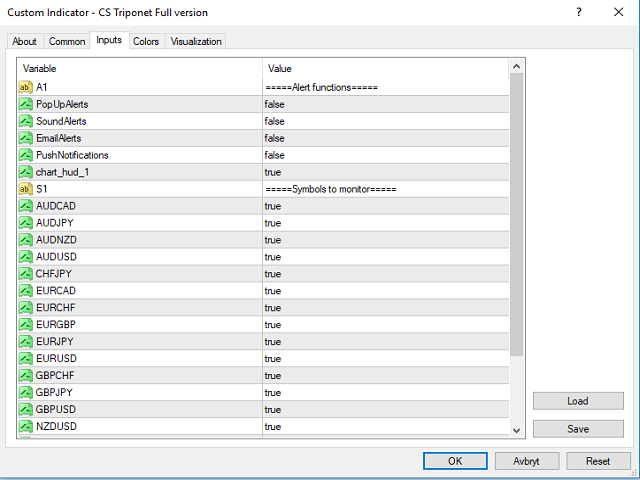 CS Triponet is an indicator used for manual trading catching big long trends. Signal is given to either go long or short and the market orders are placed manually by the user on timeframe M5 or M30, stop loss and take profit levels are also set by the user. Advise to search for key levels highs and lows, support and resistance. Indicator equipped with alert functions - Visual, popup with sound,email and push alerting the trader when to take action and ride along with the trend. Supports 19 currency pairs, if one missing you like to trade contact me and a make an update with your favourite pair. Version 2.3 equipped with additional confirmation timeframe M30 wich i belive makes it a bit more accurate but still the user always has to check and confirm given possible buy/sell signals if they are good or bad quality. When signal is given it's advisable to enter the market on M5 or now the new timframe M30 as this is the signal main confirmation timeframe(s) and the other 2 is H1 and H4. I personally recommend to actually ride along when a market order is placed to the journey towards the key-levels you have found, exit too early could result with a ruined trade. Everybody has their own trading style and this was just a recommendation. Use the free version of this indicator to get familiar with how it works. Note: The Picture of the chart indicator display has been used with a template - black background. Either you open 2 charts, place the indicator on one with the chart color settings set to all black, and using the other normal to trade on or you simply putting the indicator direct on chart M5. Well that is up to you trader. Well follow the described steps above. 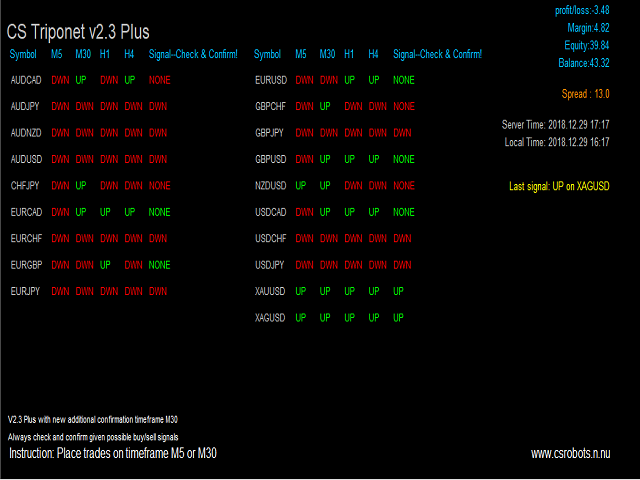 On the chart you will have information about the M5, M30, H1 and H4 charts signals. To enter the market correct, all 4 has to be either green -Up or red-Down and the status 'Last signal' has to be either Up or Down, then you have a possible buy or sell signal. If no signal been given the status 'Last Signal' displays NONE. Remember this indicator wont generate 5-10 signals a day as it's a long term trend following indicator and should not be mixed up with scalping or similar. It could be day(s) or week(s) without any new signal but when it comes, be sure to check and confirm the given signal, if it's a go....well ride along but remember to use additional indicators to find important key levels to set stoploss and TP such as fibo, pivots, supply & demand and so on. Email Alerts= True or False (An email will be sent to your email address when signal is given) If you have set up the email function in MetaTrader 4 of course. Added additional confirmation timeframe M30 for better accuracy. Some improvements to the signal table and now the ability to turn on/off the hud itself. In version 2.1 update PushNotifications were added when possible buy or sell signal appears. To use this function you need to activate notifications in your terminal along with your MetaQuotes ID. Remember that signals generated with this indicator only gives you a 'possible' signal and that doesen't mean it's a valid buy or sell. All signals need to be further validated as in the description how to use CS Triponet.